Rockman Corner: A Little Something Extra In "Power Battle Fighters"
A Little Something Extra In "Power Battle Fighters"
To compensate for a lack of their own Anniversary Collection, Japan received Rockman Power Battle Fighters, a special compilation of the two arcade games, The Power Battle and The Power Fighters, complete with an exclusive bonus feature not found in its North American counterpart. The original games enable one or two players to take on a series of Robot Masters cooperatively. In the Power Battle Fighters, however, a new mode has been added, that of a special versus mode reminiscent of the hidden Mega Man Vs. Bass fighting game from MM7. Here, players can square off against one another in an all out brawl with an array of Robot Master weapons at their disposal. 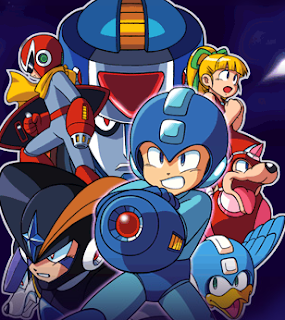 The roster is scarce, limited to the likes of Rockman, Blues, Forte and Duo. All in all, the versus mode is a nice little treat, but really lacks in the "depth" department; not enough content to warrant a purchase really. Still, PBF is something collector's might want on their mantle as the title is somewhat of a rarity (limited release run). That said, ebay is your go-to place. Ah yes, E-bay. You never disappoint us... until the prices come in. That right there is the coolest style of classic Rockman drawings. There are a few that make me cringe, but that's the one that made me love this series.